We are one of the most prominent and active manufacturers and importers of Mini Offset Printing Machines in national and international market as well. For excellent printing on cards, sticker sheets and office stationery, our offered machines are highly demanded in the market. It comprises of three cylinder small offset with suction feeder to print using conventional plate or direct polyester master. Available in 15" X 20", these Mini Offset Printing Machines have various features like compact design, easy operation and high quality production. Customers can avail these machines at pocket friendly prices. SAHIL- 11" X 16" : This Mini Offset the low height machine is designed from the human engineering point of view. The compact design of mini offset machine, the sensible arrangement of all control elements with in an easy reach of operator and its operation make it easy to handle & make SAHIL a real user friendly ONE MAN OFFSET. This mini offset printing machine provides an excellent value for money to printers entering into offset printing field with low budget. These Mini Sheet fed Offset Presses are very useful for Letter press /Treadle printers, Screen printing house & Small offset printers for urgent requirements of printing jobs like. This is an entry-level mini offset machine for 15" X 20" segment. It can be used for printing using plate or polymasters. It also provides facility to use double polymasters for printing at the same time. 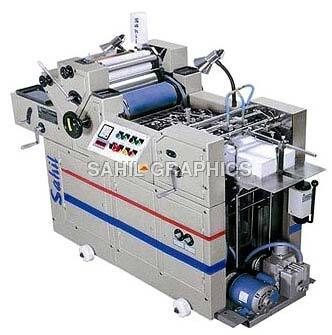 This Baby offset machine is popular among DTP centers, Xerox Centers and those who convert from letterpress to computerized little offset printing press. This little master offset machine is a very economical machine and gives swift and excellent performance combined with long life. It is extremely user friendly and is extensively used for short run multi colour jobs ranging from 6" X 4" inches to 15" X 20" inches on 30 gsm. manifold to 300 gsm. paper / board. This 15" X 20" size mini offset press is sleek & swift machine.The feature of both 11 X 16 and 15 X 20 size machines are common. SAHIL mini offset machines have an excellent reputation for its advanced features & un-complicated high quality production compare to other Indian brand, imported, used or rebuilt machines. Metallurgy : All three cylinders in the machine are made of hi grade casting. SAHIL offers dynamically designed engineering and rigid steel structural main frame. Heavy-duty side casting in the print head and sturdy feeder and conveyor components are vibration free and dependable. Shorter Make Ready : All the operations of the machine such as paper feeding to delivery, ink setting & water control, plate cleaning and changing, Blanket wash-up, vacuum & air blower pressure adjustment, etc can be easily done by a single operator from one position only, as compared to other small Offset Printing Machine available in INDIA. Centralized Lubrication : Central lubrication system by Pump which distributes oil by pipelines to various rotating parts, Bearings, Shafts etc. Chain Delivery : The Chain Delivery contains 3 gripper bars each one with 5 / 8 grippers. The design of chain delivery is user's friendly and easy. Plate Cylinder : Hard Chrome Plated Plate cylinder has facility to vertical image shifting of 360 degree. It has universal plate clamping system, which clamps Unpunched Plate/Master. It has a facility to do 8 mm cross & lateral shift of the Plate. Universal suction feeder : Machine has Automatic High Speed Vacuum single sheet paper feeder with top sheets separating & fine air blowers System in the feeder unit. It has a vacuum and blower air pressures can be independently controlled as per paper stock & sizes. Conveyor belts with front runner ensures smooth feeding of paper and reduce wastage. Register Board : The Register board has 4 / 6 High Quality end less belts, which helps to run paper trouble free. It is easy to set as per minimum to maximum paper size. The Unique Side Lay : The side lay is made of 10 mm push type plate to register the paper up to maximum size. This side lay also reduce the crossing of paper. It has a parallel adjuster facility to correct up to 3 mm of cross in paper cutting. Electric Control Panel : Sahil Control Panel ensures operational ease. Simple and user-friendly controls like-machine ON/OFF, vacuum ON/OFF, speed controlling, Iph display& digital counter for operator safety. Printing Sheet Size Max. 279x406mm 11"x 16" 381x508mm 15"x20"
Sheet Size Min. 127x178mm 5"x7" 127x178mm 5"x7"
Printing Area 254x394mm 10"x15.5" 381x495mm 15"x19.5"
Gripper Margin 9.0mm 0.354" 9.0mm 0.354"
Gripper Bite 4 to 6mm 0.157" to 0.236" 4 to 6mm 0.157" to 0.236"
Plate Size 304x430x.30mm 12"x17" 455x508x.30mm 18"x20"
Blanket Size 304x455x1.9mm 12"x18" 455x533x1.9mm 18"x21"
Feeder Pile Height 406mm 16" 406mm 16"
Delivery Pile Height 355mm 14" 355mm 14"
Inking Total No. of Roller, No. of Foam Roller 14 Nos. 2 Nos. Rubber-7 Nos. Copper-6 Nos. Steel-1 No. 14 Nos. 2 Nos. Rubber-7 Nos. Copper-6 Nos. Steel-1 No. Damping Total No. of Roller 4 Nos. Rubber-2 Nos. Steel-2 Nos. 4 Nos. Rubber-2 Nos. Steel-2 Nos. Floor Space Length x width Height 1880x915x1295mm 74"x36"x 51" 1880x1168x1295mm 74"x46"x51"
Weight approx. 800 Kgs 1760 Lbs. 900Kgs. 1980Lbs.